Sailors of big boats have a low opinion of small boats’ ability to survive storms. I intend to take a small boat around Cape Horn, The Clipper Ship way, that is lat 50 south in the Atlantic to lat 50 south in the Pacific non stop. It is a big challenge and the only boat less than 60 feet to have done it single handedly was Al Hansen’s Mary Jane and that was in 1934. But then everything but a big challenge is boring and I think that it is a possibility that it can be done if the approach and mental attitude are right. I think I am the man to do it because during the fifty plus years that I have been reflecting on the laws that govern small boats behaviour at sea I have come to realise that big and small objects follow different laws and that big is not always better even if it is much, much more expensive. For example, some small spiders have found a neat way of journeying over long stretches of water. It is useful for colonising islands and crossing straits, spreading the species. Spiders do not have wings and cannot, technically, fly. Several types of spiders, however, can travel long distances through the air by a process called ballooning. The spiders spin long strands of silk that are caught by the wind, carrying the spiders along the air currents hundreds of miles. When they get close to their desired destination they start to eat their strands of silk, recycling it for their next trip. Obviously this process is not possible to do on a larger scale. Not even in the strongest wind would a sailor be able to get his boat to fly by throwing long lines up in the air. Big is big and small is small and different laws apply to each and nothing will ever change that. Scale affects even such mundane things as lifelines. On a big yacht lifelines can kill you. If you have a long line and fall overboard when the boat is travelling fast it can drag you underwater and drown you. If you have a short lifeline you can get stuck under the boat when it capsizes and drown. On my small boat I have a long lifeline. It will not keep me underwater when the boat capsizes. If I fall in the water even when the boat is sailing fast, the sail area is so small that the boat will stop. On a small boat a lifeline is not dangerous. Big is big and small is small and different laws apply to each and nothing will ever change that. On October 24, 1901 on her 63rd birthday Annie Taylor, a schoolteacher, rode over Niagara Falls in a barrel four and a half feet high and three feet in diameter of her own design. It was equipped with a leather harness and straps and padded with a mattress and cushions to protect her from the impact. It was constructed of oak and iron. A 100-pound blacksmith’s anvil was used as ballast. To get sufficient air for the voyage the barrel was pressurised with a bicycle tire pump. The air made the barrel into a prestressed structure, increasing its impact strength. She was unhurt except for minor bruises. This was 1901, much has happened since then in the field of composite construction and Annie who was a modern woman would today have used modern materials and the margin of safety would have been much higher. Today there is absolutely no problem building a small boat strong enough to survive any storm, including the worst of hurricanes, provided it is small enough. Contrary to what the establishment and especially the Recreational Craft Directive is telling you, it’s when boats are big that they are getting fragile and dangerous. Just imagine dragging a super tanker over the edge of the Niagara Falls and letting it crash 175 feet below, the result would be a heap of metal. Everyone knows that. Designers of big boats cannot teach a small boat sailor how to make his boat strong. Below are two examples of scale effects that are affecting small boats in stormy seas. The deckhouse and freeboard of my present boat are low, much lower than on my previous ones. Therefore I hope that I can live in the turbulent boundary layer that exists between air and water which gets thicker the stronger the wind is. I hope that in that layer the hull of my small boat will be hidden from the contrary winds and its resistance, but that the wing mast and the storm sails will be up in cleaner air creating a driving force. If it works then my boat will be able to point much higher than orthodox theory suggests. Will it work? I hope so. Small and big boats also behave differently in waves. The restoring force in ocean surface waves is gravitation. The higher the gravitation is and the longer a wave is the faster the boat travels; a cruising boat can only move as fast as a wave that is as long as its waterline. To understand gravity’s part in that phenomenon one should look at the subject from an advanced standpoint. On earth, when gravity is constant, the speed of ordinary cruising boats is 1.34 times the square root of their water line lengths. If you have a waterline of 9 feet your max speed is 4 knots, if it’s 36 feet the speed is 8 knots. The longer boat is only twice as fast although it is four times as long, diminishing returns. Should you ever happen to sail on the moon where the gravity is less you will notice that your boat is slower, on Jupiter it will be faster. Here on earth, in heavy weather, the small boat and the ocean surface move up and down. They are subjected to acceleration and it’s impossible to detect if you are subjected to acceleration or gravity or a combination of both. That is according to Einstein. When the surface water in which the small boat travels is upwards moving the gravitational force is stronger than when it is downwards moving. Therefore the speed of the small boat can be much higher in the trough than on the crest. At the crest, the centrifugal force diminishes the gravity. The boat’s accompanying wave therefore has less restoring force and hence, it slows down. But a cruising boat cannot sail faster than that wave. The resistance increases. The slowing down releases kinetic energy, which momentarily becomes her dominant driving force much more so than her sail power. 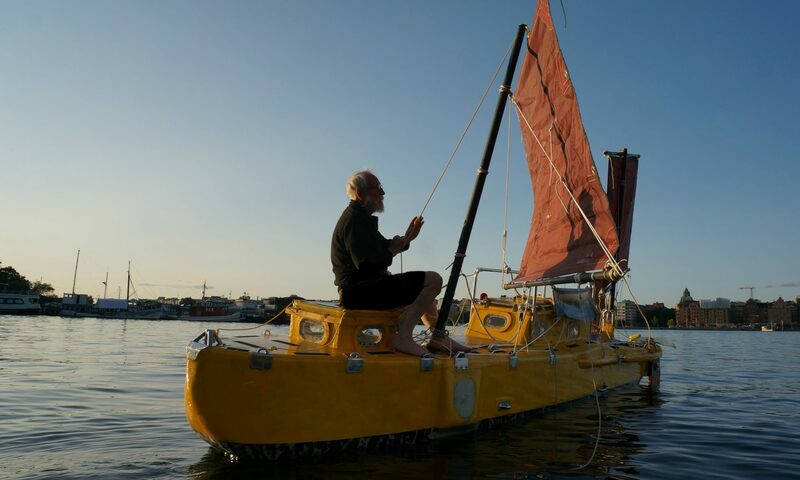 As the boat is sailing to windward up and down the waves, wind energy and kinetic energy are alternatively propelling the boat, much in the same way as kinetic and potential energy are alternatively driving a pendulum as it swings back and forth. Watching a wave approach one easily gets the impression that a mountain of water is moving towards one. This is not so. Surface water is moving in a circular pattern much in the same way as wind sometimes can create waves in high grass. If nature had not figured out this neat way coasts would be flooded in storms as immense volumes of water would have been transported to the beaches with each wave. The circulation on the crest is with the wind and in the trough against the wind. Sailing with the wind and with the boat on the crest the circulation acts as a helping hand. This is fortunate because the boat, due to the weak gravitational field, cannot move very fast through the water. With the wind in the trough the boat is met with a contrary circulation but now there is a stronger gravitational field and the boat is again helped and can now move faster through the water. When sailing against the wind in the trough one does not experience much of a problem because the circulation is with the boat. It is on the crest that the difficulties accumulate. There the circulation is against you. The gravity is weak and therefore the boat looses stability and heels over. The heeled boat has less driving force and more resistance. On top of that it cannot travel through the water as fast as before because the weaker gravity makes the waves go slower. Everything seems to be against you. But do not give up because surprisingly there is no need to worry. Again nature has found a neat solution. The surface water is, as mentioned above, moving in a circular pattern. All circular movements, by law of nature, create centrifugal forces. This one is no exception. The resultant of the centrifugal force and gravity points to the centre of the earth at the crest and trough; they combine their forces in the trough and subtract them on the crest. Midway between crest and trough the centrifugal force is horizontal; being centrifugal it cover angels. Now the amazing fact is that the resultant of the centrifugal and gravitational forces is always, and I repeat, always, perpendicular to the sea surface. Gravitationally speaking uphill and downhill is an illusion. Gravitationally speaking the sea surface is flat. It takes no energy to move up a wave face nor do you gain any going down one. That is on condition that you are moving in a circular pattern with the surface water. A drifting boat, flotsam and jetsam is living proof of this. They move up and down wave surfaces without spending any energy. A super tanker is not affected by waves shorter than itself and therefore people designing such things have no reason to reflect over what happens to smaller boats on a smaller scale. Consequently there are many things those people cannot teach small boat sailors. Not because they are stupid but because they are not familiar with and not interested in the subject.